As an outcome of new and naturally-endowed supersensible faculties, human beings are increasingly able, as an act of grace, to experience and perceive the mighty spiritual force of the Christ Impulse. Such an experience can be spoken of as a 'naturally-given initiation' - and today we increasingly hear of individual supersensible experiences of this kind. However, if we wish to take a healthy, modern approach in dealing with these 'natural' phenomena, it is necessary that we begin to comprehend them in full consciousness and with clear thought. 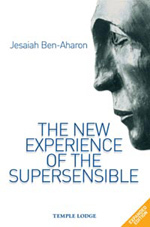 It is this all-important bridge between the naturally-given experience of the supersensible and its conscious cognition which Ben-Aharon seeks to build in this book. As a result of such a connection, "...empirical supersensible research can investigate the different aspects of Christ's etheric becoming and appearance in a way that, both methodically and experientially, fulfils the justified cognitive and scientific requirements of our age." This edition features a new introductory chapter. DR JESAIAH BEN-AHARON was born in Israel in 1955. He received his Ph.D. on the phenomenology of Edmund Husserl in 1998 from Haifa University. He is the co-founder of Global Network for Threefolding (GN3: www.globenet3.org), Activists for Israeli Civil Society (ICS: www.civilsociety.co.il), and of a School for Spiritual Science (www.ybaschool.co.il). He is also a co-founder of Kibbutz Harduf (1980) where he lives with his wife Adira and their daughter and son.